"This is a yummy recipe for fried rice." Heat a wok or large skillet over high heat; add 1 teaspoon canola oil. Cook and stir eggs in the hot oil until scrambled and set, 3 to 4 minutes. Transfer eggs to a plate, clean the wok, and return to high heat. Mix 1 tablespoon canola oil, carrots, and salt in the hot wok; cook and stir for 2 minutes. Add garlic to carrots; cook and stir until garlic is fragrant and browned, about 2 minutes. Stir peas and scallions into carrot mixture; cook and stir until peas are warmed, 1 to 2 minutes. Lower heat to medium. 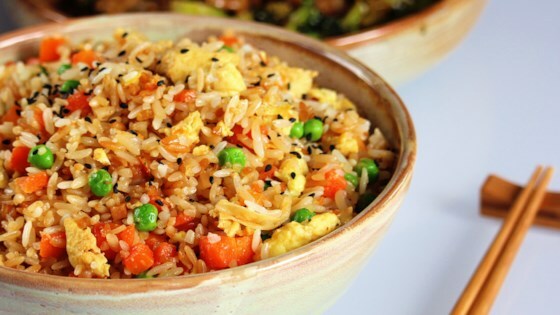 Stir rice into carrot mixture; add scrambled eggs, soy sauce, salt, and pepper. Cook and stir rice mixture until heated through, 2 to 3 minutes. I was disappointed for the amount of work here. It seemed too bland. I had to make a few changes based on what I had but it came out very well. Awesome taste and pretty simple to make. My family loved it! Also used the leftovers and added shrimp for another dinner. I didn't add the carrots or peas and I used the sesame oil. It had an excellent flavour and I will definitely make it again. Pretty good stuff. I added a bit of white pepper. Thank you for the recipe.